Self-esteem plays a role and is involved in almost everything you do – your health, your relationships, your business or your job, etc. Self-esteem is a choice you can make and then you can turn it into a habit. Think of it as a muscle that needs to be trained and stretched on a regular basis. Perform daily exercises to start increasing your self-esteem and watch yourself-confidence soar. Do not compare yourself to others … focus on being the best you can be. Never focus on one negative thing or any one shortcoming you perceive you have. Do not give in to negative thoughts – Pessimism can be a self-fulfilling prophecy. Never, ever give away your power to past people or incidents. Any time an old “tape” plays in your head, picture a stop sign or a big red flashing light and refocus your thoughts on something positive you like about yourself. As far as any past mistakes, forgive yourself and use them as an opportunity for learning and for growth. Set realistic expectations for yourself and for your relationships. Make yourself a priority and learn how to say no. Look at your self-esteem inventory and recognize and embrace your positive qualities. Write down three things about yourself that make you happy. FOCUS on these. Write down your accomplishments. At the end of each day write down what step(s) you took to move yourself forward in your life and/or in your business. Compliment yourself daily and create a daily affirmation or daily mantra. Stretch your comfort zone daily … You need to be willing to change things up and do them differently. Every time you do something where you stretch your comfort zone, you become a little stronger, a little more empowered, more able to tackle what life throws your way head on. It’s how people become the people they’ve always wanted to become, by taking risks and trying things they wouldn’t ordinarily do. Eat healthy, exercise, work on managing your stress levels and get enough sleep – you will feel better and because you are doing something positive for yourself, it will increase your self-esteem. Smile – changes blood flow to the brain and can actually make you feel happier and relieve tension. A smile sets off chemical and physical reaction within your mind and body – releases endorphins that boost your mood. Do something you are passionate about. It will give you a sense of fulfillment and purpose and kick your self-esteem up a few notches. Celebrate… Celebrate… Celebrate… each and every success along the way. Small successes are equally important to the larger ones. Stretch your self-esteem each and every day. What not to do if you want to improve in this area. That and more today on the New Rules podcast. Announcer: Today’s show is sponsored by the Empress cloth on Amazon theempresscloth.com. Check it out save time, save money, save the environment. A much healthier way to clean for you, your family, your loved ones and your pets. Holli: We’ve made it through 25 episodes? Wow! I am so hoping that you are taking a golden nugget and applying it after every one of the episodes and that really it is helping you to improve your life and your business. Again I’d love to hear from you. What changes you’ve made. What worked. What didn’t work and perhaps what you can share can help somebody else, truly learn a new rule for their life or their business. So at this point I wanted to hop in and do an episode because well 25. That’s a lot right? We’ve really made it this far. I’m thrilled to still have you all here. Now, I went back and I was starting to review the past shows and I what really sticks out for me with everything? You know how can I bring this all together? Is to just bring you an episode and a new rule today. I started looking back at …okay…. How can you take the responsibility for your life, how to get involved in the new media, getting a return on your investment, a return on your life. How to negotiate. How to embrace change… never ever giving up, no matter what challenges you face etc etc. And one factor started really staring me in the eye. And that was you’ve got to have a really good self esteem to accomplish any of those. Holli: Is to Stretch Your Self Esteem Muscle. Now, self esteem is a choice you can make and then you can turn it into a habit. Just think of it as a muscle, that needs to be trained and stretched on a regular basis. So before I start jumping into some strategies that I think could really help you stretch your self esteem muscle, let’s just talk about a few of the things that you should not do. Definitely do not compare yourself to others. Focus on being the best you can be. Look, we’re all unique; we’re all created with a gift. We all have wonderful qualities. We all can be only the best we can be. Look, I’m 5’2”, who knows now if I’ve shrunk, but if I had ever wanted to play on a basket ball team, that was really not possible for me. So that wouldn’t be something that I could focus on. Another thing, never ever focus on one negative thing or any shortcoming that you have. Look, we all do have shortcomings, whether it’s an emotional, a physical, mental. Something, we all have, that is a shortcoming of ours. Let it go. Just recognize that we are multifaceted and very complex creatures. We are made up of, we are made up of a lot of different things. So just don’t focus on one negative thing. Let’s just change that all up and we’ll start focusing on the positive. Very important, don’t expect perfection. It’s simply unattainable for any of us. We’re never going to be perfect. We’re never going to have the perfect body, the perfect life, the perfect relationship, the perfect children or the perfect home. We all revel in this idea because we see so much of it and it’s just really an artificial creation of society. I think the media makes it like “Oh yeah, you can attain this.” But truthfully it doesn’t exist. So let’s release perfectionism. Release perfectionism and go with the motto or the mantra that, “Something is better than perfect.” So really throw that word out and give yourself a break. You know if you expect perfectionism and you don’t achieve it, all of a sudden you feel guilty. So let’s throw out that word out also. And I love this quote by Kelly Preston where she said “Wellness isn’t about depravation and it’s not about perfection. It’s about pointing yourself in the direction of growth, training yourself to get comfortable with your highest potential, and then taking small steps to support that shift. It’s about showing up for yourself, day by day, and then one day finding that you’ve undergone a transformation”. So you see it’s about progress and not perfection. Aim for your accomplishments and you’ll focus on the steps that you have achieved, which we’ll get to in a few minutes. I’m not going to really go into this, because it’s a very in depth topic about how people who have a tendency to think negatively. So I am just going to touch on it very briefly here. Because when you think negatively and that is the predominate thought that always comes up, is that you’re always focusing on the negative. Pessimism really can be a self fulfilling prophecy. So this may be an area that you need to work on. But again I’m not going to make this a focus of our podcast today. Do not give away your power to past people or past incidents. Self esteem is truthfully useless if you base it upon an older version of you that no longer exists. So you have to just keep adjusting your self image to the today, to the now. Adjust it to match your current abilities and skills, not those of your past. You know if somebody said something to you…. you’re too fat, you’re too thin, you run too slow, you’re not smart, you’ll never be able to amount to anything, you can’t do it. Forget it, that’s in your past. Throw it away, put it in the garbage. And any time an old tape plays in your mind like that… what I want you to do is…..picture a stop sign or a big red flashing light and just say “STOP” and don’t let those thoughts keep playing in your head. Stop them and shift the direction that they are going. You can do this if you work at it. Take a self esteem inventory. Take a piece of paper, draw a line down the middle and on the right side write your strengths. On the left side write need improvement or your weaknesses. I like to say need improvement. That’s a more positive way to say it. But list all your assets, your skills, your experiences, your education, your physical and social resources, talents, anything else that makes you feel good about yourself. Also write down what compliments others have given you. That will help with your self esteem. Any problems obstacles or challenges that you have faced and overcome. And also if you couldn’t solve them yourself and you knew where to find the help. If you’re resourceful, that definitely goes in the strength column. Then look in the mirror and write down the physical attributes that make you feel good. Think about what’s inside. Is it your style? Do you have a sparkle, energy? Are you kind, compassionate, generous…generous? And if you’re not sure, if you need more, ask someone that you really respect to give you a list of some things you can put in your asset column. And yes, do look at the list of your weaknesses. But we are so not going to focus on those. You know, if you made any past mistakes forgive them. What I’d like to say is that any time you did make a mistake you can use that as learning and a growth opportunity. You know, use that as if you’re in an experiment and that’s data or information for the future. You can just learn from any time you made a mistake or any time you experienced a failure. In the future you want to set realistic expectations for yourself and for others. You know this really stops us from being disappointed in ourselves when we don’t reach some unrealistic goal we’ve set. And also what I’ve learned in life, when you are in a relationship, whether it’s a friendship or romance or any kind of relationship between 2 people. Try not to expect anything. When you do, you set yourself up for disappointment. The other general thing is to now make yourself a priority and learn how to say no. Stop being pulled in a thousand different directions. You cannot imagine how liberating that will be for you (laughing) is to learn how to say no. I remember, well this goes back so many years when I was raising my children and I was involved in all these committees in the community and I was chair of this and chair of that. And, finally I said I just cannot keep stretching myself in all these directions and the first time that I made myself a priority and I learned how to say no. Boy I was standing inches taller. So that really can be something that perhaps you need to work on. So let’s talk about some strategies now that you can do to really start stretching this self esteem muscle. You’re going to start with small steps so that, you little by little can gain confidence. And this will really make a huge difference for you. If you listen back to my first podcast where I talked about how just a tiny little adjustment can really change your life. It truly can. So start everyday making these little steps to really stretch this muscle. Look at that list of all your positive assets. Recognize and embrace all your positive qualities. Look at the positives. What you do like? And also, keep a journal. Write down 3 things you like about yourself that make you happy. Focus on these. Really take the time to think about them … really think about them. Also compliment yourself daily. Gee, your hair looks great or wow…what a pretty shirt you chose to compliment those pants. … I love that lipstick. You know that really just makes my eyes pop! Whatever it is give yourself a compliment daily. The other thing is … try to create a daily mantra. You know the little train…. “I think I can I think I can”. And of course the little train could because he kept persevering. And you can do the same thing by creating a daily mantra for yourself. Like wow, today is going to be amazing. I’m going to step into my power and really conquer the world. Create that daily mantra and really say it each and every day. I think this next one is so important that I actually wrote a book about it. You need to take some time for you each and every day ~ Do something nice for yourself. We actually had… an episode about this aways back called “A tap into your inner child and play” So any way you want to be nice to yourself, whether it’s taking a bubble bath, a walk in the park, reading a pleasure book, listening to music. You choose. It’s all about you. And what I’d like you to think about too when you start doing some nice things for you, once you’ve done what you really like, try something different that makes you feel like a million dollars. If you’ve never had a manicure go have a manicure or pedicure, or a massage or a facial. Boy, start living like the rich and famous. Start feeling it, bringing it into your whole being. And that will make you feel like a million dollars. Step out of your comfort zone. Let’s take that back. Don’t step out of it. Let’s just stretch it. You need to be able to change things up and do them a little differently. And every time you do something where you stretch the place where you are always comfortable and doing the things you normally do, doing something just a little bit differently, you become a little stronger a little more empowered. More able to tackle whatever life throws your way. It’s really how people become the people they’ve always wanted to be. They take risks and they try things they wouldn’t ordinarily do. And I will tell you, I had to experience this year when I was at a meeting where I was speaking. And I was in the corridor where the vendors were. And I’m not going to go into the gory details. But there was a gentleman with animals there and a snake. And he told me if you teach empowerment and you work with people and this is something you’re afraid of, you need to come closer to this snake. And…I had to work up to it. I really had to go through the whole….you know working through my brain that I can, I can and how I’m going to feel afterwards. And I actually did it. I was like so far….really it was the stratosphere, outside my comfort zone. But you know what; it really made me feel…I can do anything. And I know you can do anything too. That also will just stretch that little muscle more and more. So all these things that I am going through, may be a lot. But if you pick one and focus on one at a time, make that a part of your life then you can add another one. And little by little you’ll have all these tools in use and you’ll be really on your way to getting your self esteem 100% where it needs to be. Eat healthy, exercise and work on managing your stress levels. And also get enough sleep. This will….all these together really help you feel better and it makes you do something positive for yourself. Again it increases your self esteem. So yes, that old “early to bed early to rise” and eat healthy and exercise really do make a difference. Just to smile. Smiling changes the blood flow to your brain and can actually make you feel happier and relieves your tension. Smiling, sets off chemical reactions and physical reactions within your mind and body because it releases endorphins that we know boost your mood the same way exercise does. So just smile. You will find that just by that simple little exercise smiling, you really can’t go back to that negative mood. It’s hard to frown or it’s hard to think of something negative when you’re really focused on smiling and turning your lips up. So there’s so much more we can talk about as far as increasing your self esteem, but I don’t want to get too lengthy here…. you know another time we can talk about dressing for success, good posture, hygiene, giving back….because, boy does that help you feel so much better. And so many other things you can do when you’re at a business meeting, or at a convention, or something where, you can just make yourself stand out and really feel like a million dollars. Do something that you’re passionate about. This is very important especially for somebody who has become an empty nester, or they’re divorced or widowed. 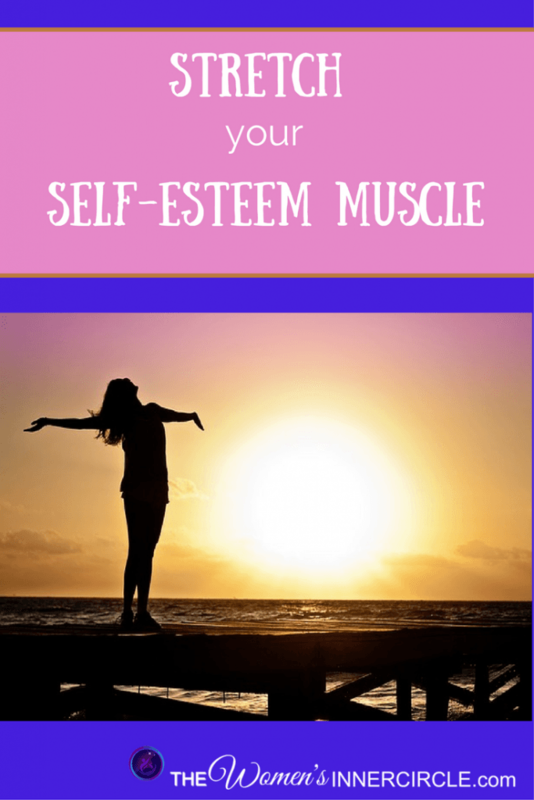 Life has changed for so many of us… And this can really be a major hit to our self esteem. Because we need a new reason to get up in the morning. So by doing something that we’re passionate about, we have a sense of fulfillment and purpose. We have a reason to get up to smile, to skip. We have an overall happiness and quality of life because we’re doing what we love. So find something that you’re passionate about and work on it. Because if you’re passionate about it you’re going to do a great job and boy will that really stretch your self esteem. So think about that and if you have a problem finding something that you’re passionate about or if you are not sure which direction you’re wanting to go in, feel free to just send me a quick email. Holli: The quote for today is “Loving who you are is self empowering”. When you trust yourself and you take 100% responsibility for making the needed changes you really become so empowered. And when you’re empowered you have the confidence to tackle whatever you want in life and in your business. Now every time you have accomplished something, you have written it down in that journal, I want you to celebrate. Celebrate, celebrate, celebrate, each and every success along the way. Small successes are equally important to the larger ones. Again this is like just doing something nice for yourself each and every day. But again this comes when you have accomplished something. You’re going to have a mini celebration. Have you joined our 30 Days to Happiness yet? Click here to join our Movement.